Is an optimization technique consisting from 6 steps as shown on the diagram bellow. The request is forwarded by node.js to the database or other data storage service. 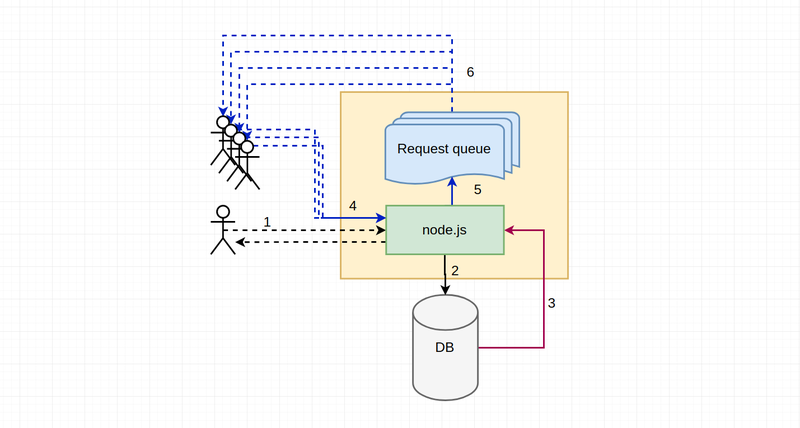 We store the request handler in a batching queue. After we got the response from the database we iterate the queue and send back the response to all clients. We will build a simple endpoint using express and mongodb. I added in a mongodb database 1,000,000 documents. utilize is the class name generated by faker, it is just a random word. For 10 seconds with a 300 concurrent users I managed to handle 2977 requests, a very poor result. We will create a new file named worms-batching.repository.js; Where we will optimize our code using the asynchronous batching technique. As we can observe we store all the requests in an activeQueue and when we get the result from database we just iterate the queue and send the responses and then we nullify the existing queue. After optimization we managed to serve 33339 requests. 11 times better than the initial response.